At the Lindale Area Chamber of Commerce it’s our job to help you succeed. We help you build connections in the community by providing you with opportunities to connect with others face-to-face or online. Your business listing and contact information on the LindaleChamber.org business directory. Receive a complimentary business listing in our special edition Community Guide. Stay informed of services and activities that matter to your business with your subscription to the LACC e-blast. Receive LACC seminars, programs and event mailings to keep you up to date on the latest Chamber events and educational opportunities. It pays to be a member. Access special pricing for LACC seminars, programs and services. All eyes on your business description, online, and social media links on the LindaleChamber.org business directory. Advertise in the LACC special event publications. Receive a listing of your business in the LACC special event publications. Show your Lindale pride with a LACC window cling for your entrance. You have the option to purchase a plaque. Receive business referrals from the Chamber staff. Need help with your marketing or other business concerns? We will send you invitations to enrich your knowledge base at our LACC Lunch & Learns throughout the year. Meet new customers and fellow businesses with exclusive invitations to Ribbon Cuttings, Grand Openings and Networking Night events. 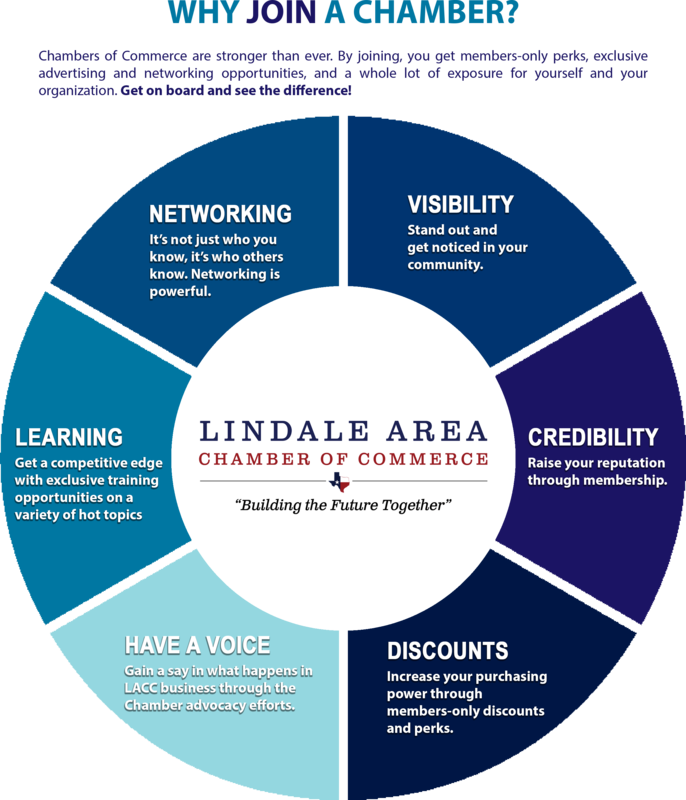 Stand out with a new member announcement on the LindaleChamber.org website. At 2,600+ facebook followers, you’ll be sure to get noticed with a Social Media Spotlight. Purchase the Chamber membership mailing list for your next marketing campaign! That’s 750+ contacts to promote your business to. Display your business cards and brochures in the Chamber office lobby and the Visitor Center lobby. Receive credentials to log-in to LindaleChamber.org and update your business listing. Meet new customers and fellow businesses with exclusive invitations to Grand Openings and Networking Night events. Show your leadership and stay active by participating in LACC committees & more. Play host and show off your spot! Have the opportunity to host members for Networking Nights, Lunch & Learns and more! Let the LACC distribute your press releases and media alerts to the membership with an e-blast. Get recognized with a basic Ribbon Cutting or Ground Breaking with the LACC. Have an upcoming event? Share it with the community! You’ll have the opportunity to post events to the LACC Community Calendar. All eyes on your business description with an enhanced listing in the Community Guide. Receive a $100 credit toward your choice of advertising, marketing & design services. Enjoy a $100 sponsorship credit to use towards LACC events. Business listing and description on the LindaleChamber.org business directory page with an embedded video and graphic of your choice. The LACC coordinates logistics, designs and shares a digital invitation for your ribbon cutting/ground breaking to members and city officials with media releases. Receive credits toward your choice of advertising, marketing & design services, luncheons, lunch & learns, breakfasts, shred day, Rodeo, Golf Tournament, Harvest Hustle and Banquet sponsorships. All eyes on your business description with a listing on the LindaleChamber.org business directory page. This includes an embedded video and graphic of your choice. The LACC coordinates logistics, designs and shares a digital invitation for your ribbon cutting/ground breaking to members and city officials. A photo, video interview about your business and brief caption are published in the Lindale Newspaper, shared on LACC social media platforms, and sent through email blast to membership. Social media cover photo graphic with business information. Receive credit toward your choice of advertising, marketing & design services. Enjoy a $400 sponsorship credit to use towards luncheons, lunch & learns, breakfasts, shred day, Rodeo, Golf Tournament, Harvest Hustle and Banquet sponsorships.